Vincent Award #67 goes to Justin Gallegos because on April 29, 2018 he crossed the finish line of the Eugene Half Marathon in Eugene, Oregon. But lots of people run a half marathon so what makes Justin's run so special? Justin has cerebral palsy, a neurological disorder that affects muscle coordination and body movement. Cerebral palsy makes walking (much less running) nearly impossible so a half marathon is down right incredible. Gallegos had to rewire his body to run. He dragged his feet a lot, which caused him to fall. So he had to learn an entirely different way to move his body, forcing himself to pick up his feet and lift his knees more. Over time, he was able to strengthen his muscles, improve his coordination and fix his gait to the point where he no longer needed those kneepads. Congratulations Justin and thank you for inspiring us all to keep pushing just a litte bit harder. It has been nearly 3 years since I have given out a "Vincent Award" (check out my "about" page for more info on the award), but when I came across this news article I just knew that this man's selfless acts needed to be commended. So Vincent Award #66 goes to the Australian James Harrison. James' blood contains a very rare antibody that is needed to formulate a medication called "Anti-D"...which is needed to save babies from a disease called Rheses disease. 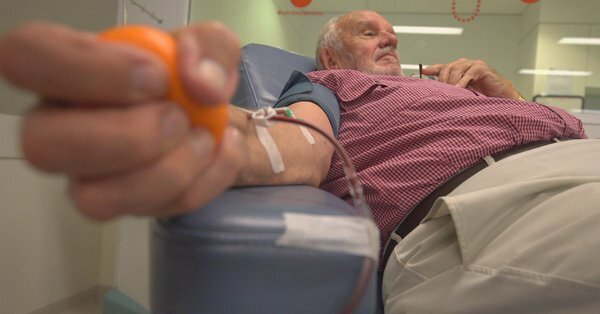 More than 2 million babies have been saved by Anti-D since 1967 and people like James Harrison have helped make that happen (James has been donating his blood for 60 years). What this story points out for me is that we are each given unique gifts and it is up to us to decide if we share these gifts or waste them. James chose the former. Thank you James.